The silencing of critics of Israel using anti-semitism as the pretext is far from restricted to the current wave of attacks on Jeremy Corbyn and his Labour party. It is now used to intimidate anyone who steps out of line on Israel. Once we raged against the conflation of anti-semitism and anti-Zionism. We have so lost that battle that it is now standard operating procedure for Israel’s apologists to conflate anti-semitism with simple criticisms of the current ultra-nationalist Israeli government. Here is an illustration of our defeat, reported in the Israeli daily Haaretz. 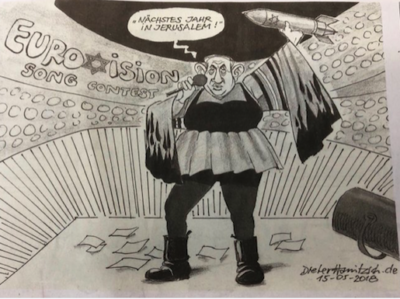 It concerns what would in other circumstances be a fairly standard satirical cartoon: this one published by the German newspaper Süddeutsche Zeitung about Israel winning the Eurovision song contest last week. Israeli prime minister Benjamin Netanyahu is shown on stage dressed as Israel’s winning singer, Netta, and proclaiming “Next year in Jerusalem!”. After the usual outcry, the cartoonist, Dieter Hanitzsch, was sacked. No Charlie Hebdo-style concerns about free speech on this occasion, it seems. As has become familiar in these cases, Wolfgang Krach, editor-in-chief of the Süddeutsche Zeitung, seemed unsure himself whether the cartoon was actually anti-semitic. But presumably he thought it better to fire the cartoonist just to be on the safe side. Let’s hope Hanitzsch can take Krach and his newspaper to the cleaners at a labour tribunal. One critic, Jonas Mueller-Töwe, who sounds like Germany’s version of Jonathan Freedland, has claimed that “a Jewish star” – that would be Israel’s emblem of the Star of David – on a rocket held by Netanyahu suggests that “behind every war, Jewish interests are hiding”. Instead we could simply trust our eyes, which provide a different meaning: that Israel, a highly militarised state, won the Eurovision song contest at the same time as it was devastating Gaza – again – and will now be able to use its hosting of a popular cultural event in Jerusalem next year to whitewash its war crimes. Before we get too exercised about the significance of every detail, we should remember that political cartoons, by their very nature, need to use symbols as shorthand for more complex ideas. We demand the impossible from a cartoonist if we expect them to offer us political satire while denying them the possibility of using symbols. So what is anti-semitic about the cartoon? It’s not about Jews, it’s about the Israeli prime minister and his war agenda. And Netanyahu’s purportedly “oversized nose, ears and lips” are surely well within the normal bounds of a caricature. Do we really want to impose a unique demand on cartoonists when dealing with Israel’s leaders of drawing anatomically precise images? The problem here, as with the anti-semitism “crisis” debate about the Labour party, is that it is totally divorced from any sense of proportion or reality. The question we ought to be asking in a case like this is: what kind of satirical cartoon lambasting Israel could ever satisfy the criteria being demanded by the current anti-semitism watchdogs? And in consequence, what cartoonist is going to dare to deploy their satirical skills against Israel when the response is invariably going to lead to their being accused of anti-semitism and possibly losing their career and their reputation? That is precisely what weaponising anti-semitism means. It hands Israel a get-out-of-jail-free card. It intimidates opinion formers – journalists, cartoonists, comedians, politicians, civil society leaders, human rights activists – by making the issue of Israel so toxic that none dare touch it. One need only look to the BBC to see the result: a mix of anaemic fence-sitting and outright censorship when covering Israel. As Archbishop Desmond Tutu famously reminded us: “If you are neutral in situations of injustice, you have chosen the side of the oppressor.” A submission to those who abuse anti-semitism to make Israel unassailable entails terrifying consequences for the Palestinians. It requires that, after decades of betraying them, we in the west once again turn a blind to their suffering. And, as was highlighted last week in Israel’s slaughter of Gaza’s unarmed protesters, it clears the path to a future in which Israel can and will commit ever graver outrages against the Palestinians. This article was posted on Tuesday, May 22nd, 2018 at 6:10pm and is filed under Censorship, Freedom of Expression/Speech, Germany, Israel, Narrative, The Lobby.